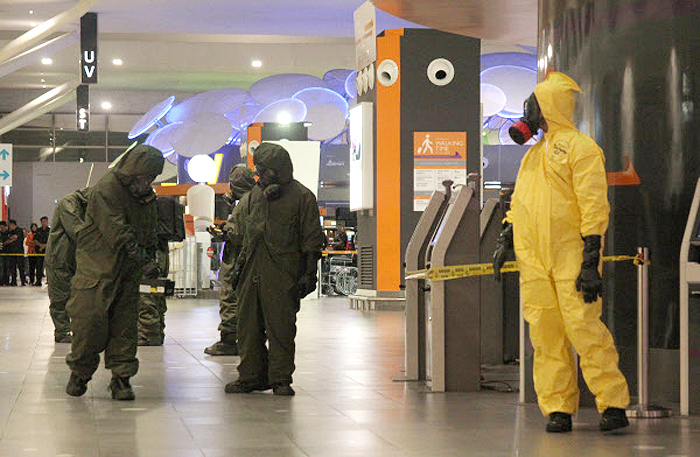 North Korea on Tuesday claimed it has no chemical weapons after allegations that the regime used the world's deadliest nerve agent to assassinate Kim Jong-nam at a busy airport in Malaysia last month. The claim came in the face of mounting international criticism over the use of VX nerve agent. Ju Yong-chol, a councilor at North Korea's UN mission to Geneva made the claim at the Conference on Disarmament. The North "has never produced or stockpiled or used chemical weapons, and our position is clear," Ju said. The UN classifies VX as a weapon of mass destruction. Ju also denied that the North was behind the hit but did not mention Kim Jong-nam's name. He denounced as "contemptible and absurd" South Korean Foreign Minister Yun Byung-se's request in an earlier keynote speech to consider stripping North Korea of its UN membership privileges. North Korea is becoming increasingly frantic after the crude hit, dispatching Deputy Foreign Minister Ri Kil-song to China after Beijing decided last month to halt imports of North Korean coal and former Deputy Ambassador to the UN Ri Tong-il to Malaysia after Kuala Lumpur threatened to cut diplomatic ties with the rogue state. International condemnation continues to mount. The U.S. is considering putting North Korea back on its list of terror-sponsoring states for the first time in nine years, while the EU announced its own set of sanctions against the North late last month. It has halted North Korea's financial transactions with other countries except for humanitarian trade and services.